Han pasado veinte días hábiles de caza y el resultado hasta la fecha no puede resultar más desalentador. Tres especies protegidas, que conozcamos o hayamos recuperado nosotros, tiroteadas por los cazadores. 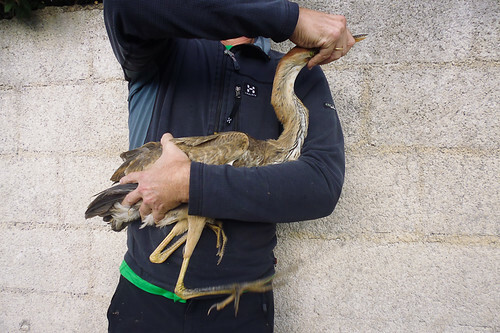 La primera de ellas nada menos que un guión de codornices (Crex crex) al que ni siquiera se dignaron en disparar y lo golpearon con un palo en Balmaseda (Bizkaia). En Gipuzkoa una garza imperial (Ardea purpurea) recogida con un tiro en Usurbil y en Tolosa una lechuza campestre (Asio flammeus). Ojo, esto es lo recuperado, a imaginar lo que se ha perdido en el monte. Dec. 18, 2012 — Male birds use their song to dupe females they have just met by pretending they are in excellent physical condition. Just as some men try to cast themselves in a better light when they approach would-be dates, so male birds in poor condition seek to portray that they are fitter than they really are. But males do not even try to deceive their long-term partners, who are able to establish the true condition of the male by their song. Can Birds Make Us Happy? Dec. 17, 2012 — As millions of us post our Christmas cards -- many of which star a robin red breast -- ecologists are investigating whether birds make us happy. Speaking at this week's British Ecological Society Annual Meeting, researchers will reveal how they are investigating the links between birds and our well-being, and explain how their results -- due out next year -- could have a major impact on UK bird conservation. Dec. 17, 2012 — A protected area network should ensure the maintenance of biodiversity, but climate is changing rapidly, thereby creating further demand for the protected area network to be efficient in preserving biota. Due to climate change species ranges are expected to move polewards, which poses challenges to the protected area network. Population changes of different bird species groups according to their habitat preferences in boreal protected areas in Finland were studied on the basis of large-scale bird censuses carried out in 1981 and in 2000. Mean temperatures rose clearly between the two time slices in Finland, for example, mean April-June temperature by 0.7 °C. The study "Preserving species populations in the boreal zone in a changing climate: contrasting trends of bird species groups in a protected area network" by Raimo Virkkala from the Finnish Environment Institute and Ari Rajasärkkä from Metsähallitus was published in the open access journal Nature Conservation. Bird censuses were compiled and organized by Metsähallitus, which governs the stated-owned protected areas in Finland. Tens of competent ornithologists carried out the censuses, which included altogether over 11,600 km of line transects. According to the study, population densities of common forest habitat generalists remained the same between the two periods, while densities of species of conservation concern showed contrasting trends: species preferring old-growth or mature forests increased, but those living on mires and wetlands, and species of Arctic mountains decreased. "These trends are most probably connected with climate change, but successional changes in protected areas and regional habitat alteration should also be taken into account," says Dr Virkkala, the leading author of the study. Of species preferring old-growth or mature forests, a larger proportion are southern than among species of mires and wetlands, or of Arctic mountains, most or all of which, respectively, had a northerly distribution. In general, northern species have decreased and southern species increased. It is suggested that climate change effects on species in natural boreal and Arctic habitats most probably are habitat-specific with large differences in response times and susceptibility. Open mires and mountain heaths change more rapidly in consequence of climate warming than old-growth forests, for which reason populations on mires and mountain heaths may also be more affected by climate change. The above story is reprinted from materials provided by Pensoft Publishers, via EurekAlert!, a service of AAAS. If You Cut Down a Tree in the Forest, Can Wildlife Hear It?